Ice cream and aquariums, beads and bangles, snakes and skulls. Sometimes it’s so good to remember what it’s like to be a child when colour, magic and wonder merge and time slows down to the moment and pauses as a shark swims above your head or when a flock of flamingos takes to the air in a breathtaking splash of pink. Days are filled with fascinating and vivid detail and summer holidays pass by in a flash of excitement and happiness. I had the chance to shed the years and spend the day enjoying central Swakopmund – everything within walking distance – discovering delights and treats that brought the dazzle back into the day and sparkle and splendour to the seconds. 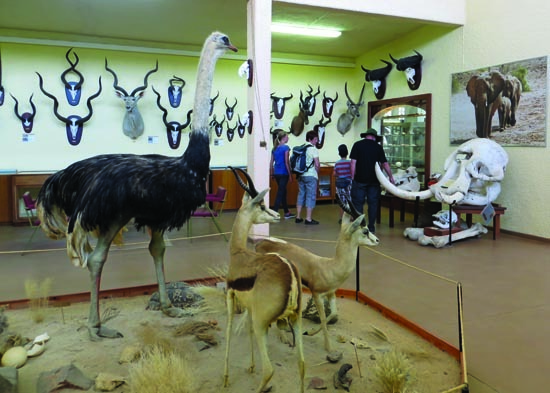 Swakopmund soon became more than curio shops and coffee bars – it became a treasure trove of fun. The first stop was at the aquarium with its jewel box of small tanks where violet anemones waved their tentacles in bursts of bubbles, starfish clung onto rocks like Christmas decorations, and long serpent eels eyed me warily from the sand. But the big tank was calling, inviting me to climb up ladders to sit on cushions at porthole windows and gaze at whiskered white barbel or gigantic kabeljou. Watching skates and sharks from below as they crossed the tunnel section of the tank was by far the most exciting part, and, of course, waiting for them to return as they circled back. I could feel everyone’s enjoyment – it was catchy – and l laughed along with every gawk and gasp. 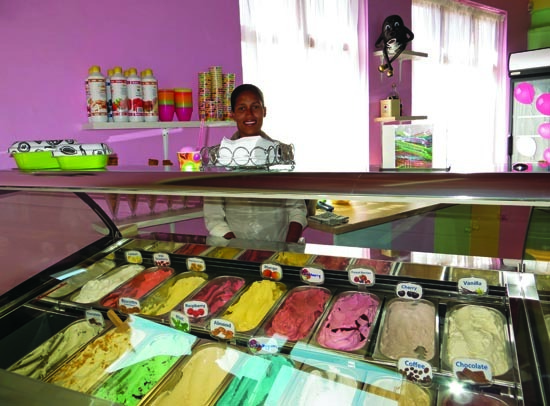 When I finally popped out into the blue-sky Swakop day, the urge for ice cream from the colourful assortment at Ice and Spice drew me to Ankerplatz. The mango flavour was tempting but a rich and decadent chocolate won hands down. 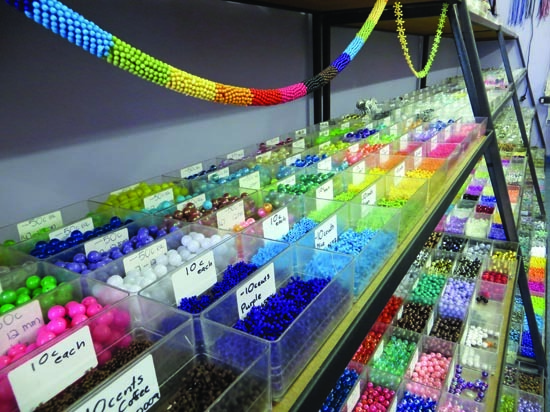 Bead World beckoned, luring me into the Aladdin’s Cave to select the brightest and boldest beads for bracelets and necklaces, before I veered towards Kristall Galerie and its myriad gemstones. This is the place where you can view the largest crystal in the world, and where you can walk through a crystal cave and dig in the scratch patch for bags of polished stones. I chose a handful and knew that I would keep a few deep in my pocket with some of my most favourite things. Lunch at Bojos (pancakes, of course! 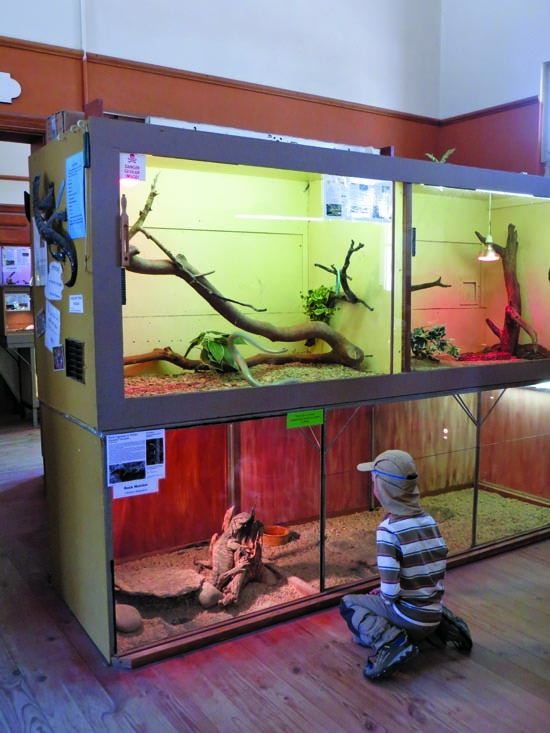 ), the Museum & the Living Desert Snake Park followed. The museum was full of treasures: butterflies and beetles, an elephant skull, 16-million-year-old fossils, a termite mound, an old ox wagon, and pieces of eight from ships wrecked along the coast. I tumbled out into the afternoon with my head spinning and my eyes glazed, and made my way to my last stop, ‘The biggest little snake park in Namibia’. Here I greeted chameleons swivelling their eyes to watch me, a prehistoric-looking rock monitor that is routinely draped over a shoulder and taken out to sunbathe, and the largest snakes I had ever seen and ever hope to see. I wasn’t there for feeding time, but hoped that I could save that for another visit. The day was finally starting to catch up and I couldn’t help stifling a few yawns. I had just enough energy to run along to the end of the jetty to watch the sun set, avoiding the waves that sprayed up through the wooden boards. I was just in time. The red sun sank slowly and gracefully and then suddenly disappeared as if it had just remembered an urgent appointment. As the light dimmed, it was time to follow an old European tradition. I turned my back to the sea. Folding my right arm over my left shoulder, I threw a coin into the waves and didn’t look back. This, I knew, meant that I would be able to return one day to do it all again.